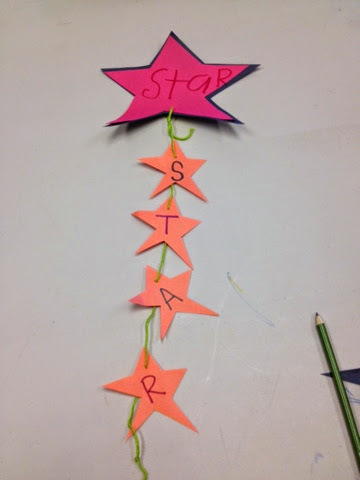 Yes, another STAR reminder (some need more practice with this than others:)! This one we made for the purpose of being able to hang in my client's room as a reminder, while keeping it discreet. 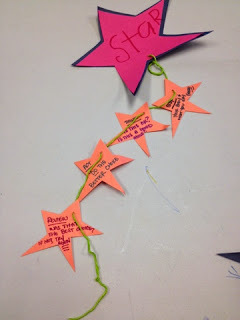 We also made examples of the steps for STAR (stop, think, act, review), including stop your body, think through choices, act on the best choice, and review whether this was the best choice. 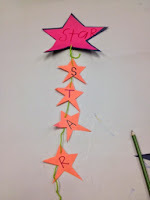 These steps will be there as a cheat sheet, but looks like a cute little mobile from the other side! Easy peazy!